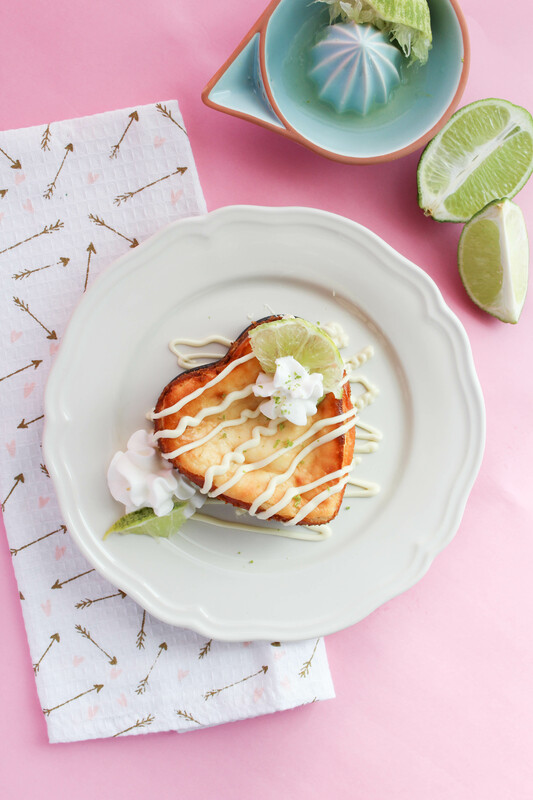 This recipe for mini key lime pie cheesecakes is the perfect dessert for the non-chocolate lover in your life for Valentine’s Day this year. And they are heart shaped too! If you guys haven’t figured out that I have an obsession with all things mini by now, I’m lucky. 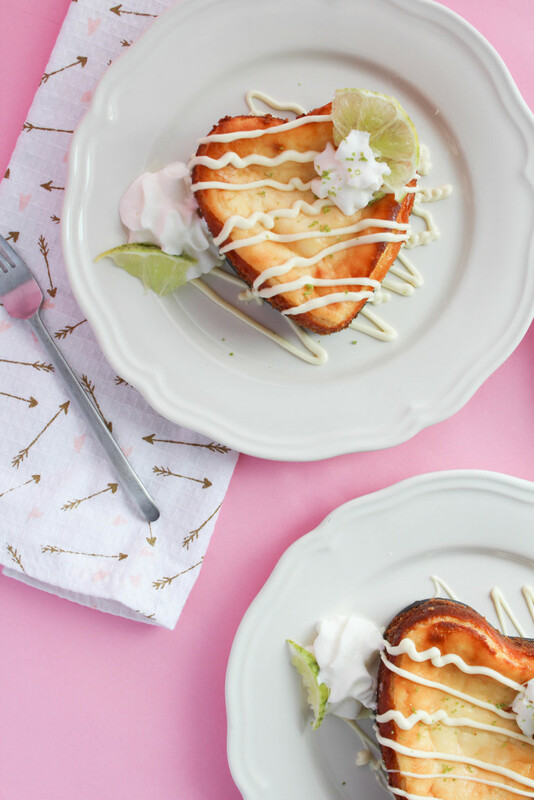 Things in mini form are just so much cuter and more delish for some reason too. Don’t ask me why, but it’s true. If you throw in a heart shape on top of that, it’s all over. Valentine’s Day usually involves a whole lot of chocolate covered everything, but there’s no reason why you can’t pave your own road and go with something unique for a V-Day dessert. And, of course, I come prepared to help you guys out. 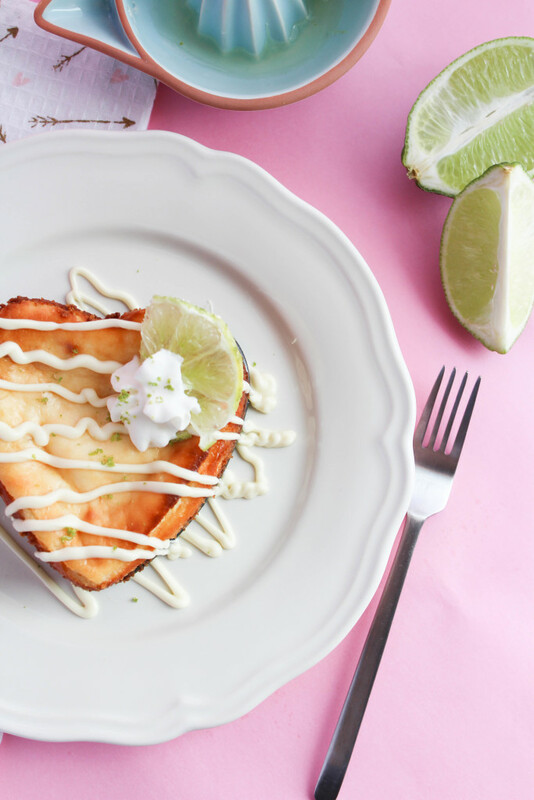 Today’s post is all about citrus! Who needs chocolate anyways? (Just kidding chocolate, I love you.) 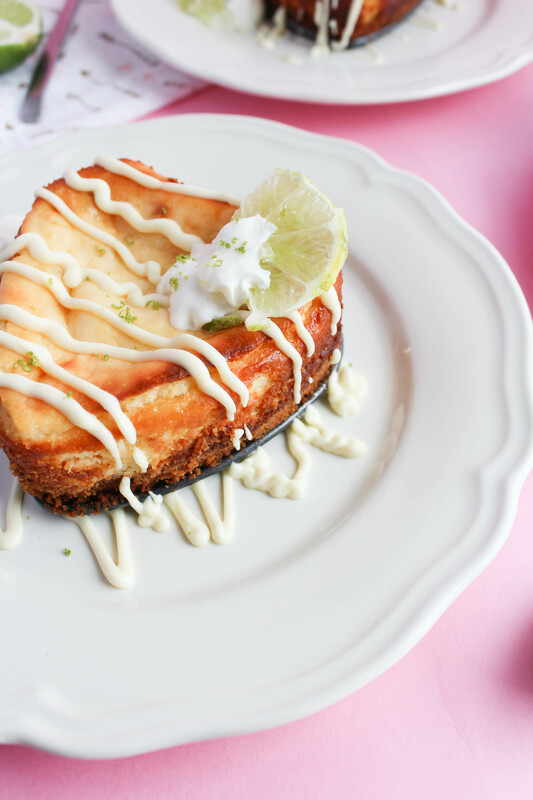 I’m making mini key lime pie cheesecakes. 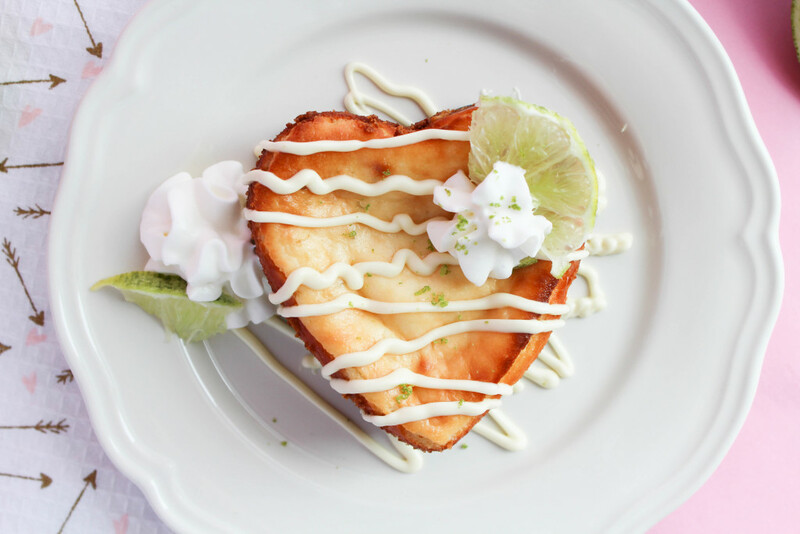 But not just any old mini key lime pie cheesecakes….mini heart shaped key lime pie cheesecakes! I picked up these spring-form pans from Target and the rest is history. 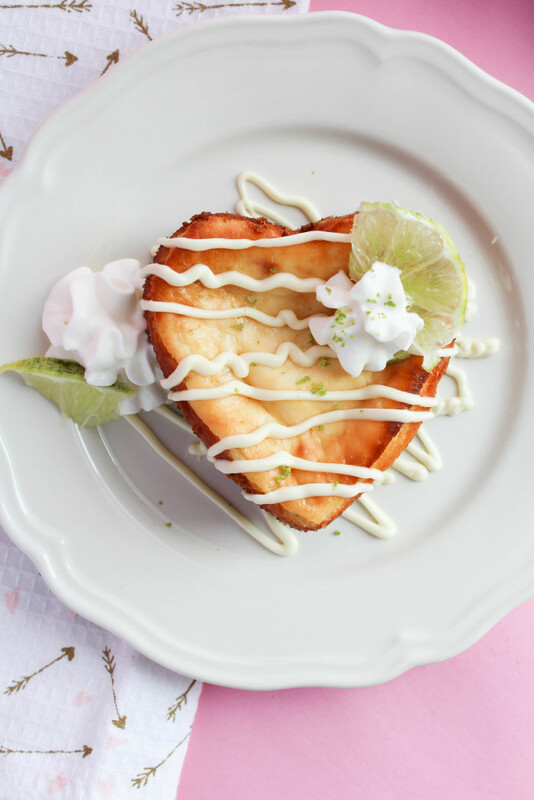 When making this recipe, you don’t need to have the same heart shaped pans that I do. It definitely helps for Valentine’s Day, but circle pans will work just as well! Combine your crushed graham crackers, cinnamon, and allspice together in a bowl. Add butter and mix well. Once mixed, press the mixture onto the bottom of your spring-form pans, going about 1-1.5 inches up the sides. Place the pans into the fridge to chill while you make your filling. In a large bowl, beat your cream cheese until smooth and no longer lumpy. Add in your sugar, lime juice, ginger root, and vanilla. Beat well. Slowly add in your eggs, including the yolk, and the sour cream. Beat on a low speed just until the mixture is completely smooth. Stir in your lime peel. Remove your spring form pans from the fridge and pour your filling into each pan, leaving about 1-1.5 inches of room at the top. Place the pans onto a baking sheet and bake in the oven for 45-50 minutes or until the center appears almost set when shaken. Cool in the spring-form pans, on a wire rack for about 20 minutes. Carefully loosen the crust from the sides of your pans and cool for an additional 30 minutes before removing the sides from the pans. Once removed, completely cool for one hour and then move to the fridge to chill for at least 4 hours total. 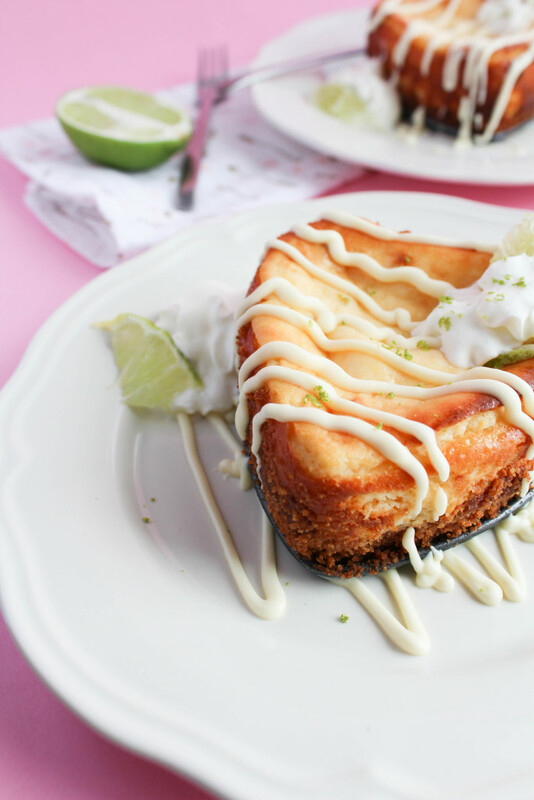 Top your cheesecakes with fresh whipped cream and lime zest to serve. These mini key lime pie cheesecakes are the perfect sweet treat to share with your partner on Valentine’s Day, or just to hoard for yourselves too. They would also make a yummy Summer treat with a scoop of coconut ice cream too!